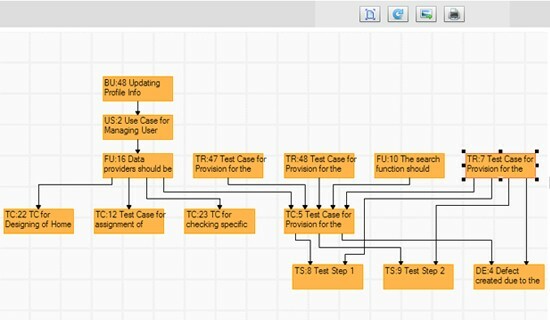 Kovair allows multiple types of relationships including custom ones between Requirements, thus enabling you to create logical links (‘depending’, ‘affecting’, and ‘bidirectional’) between Requirements and view them in a number of visualizing tools. Traceability capabilities are available in almost all ALM based tools, but it is very important to select the right one. Frequently the ‘out of the box’ defined relationships do not cater to all business needs of the organization. Worse yet, many provide limited options for configuration. To respond to this shortfall, the Kovair platform provides the unique capability to define relationships between any artifacts along with sophisticated features such as user defined relation types, impacts, and relationship attributes. In Kovair, users can define relationships between different artifacts by simple mouse click configuration with no coding required and no configuration files to edit. In Kovair, one can create a record of the related entity and relate to it right inside the form. There is a provision for associating or relating existing items as well. Every entity has a traceability matrix form. Using this form, relationships can be achieved among records of different artifacts. 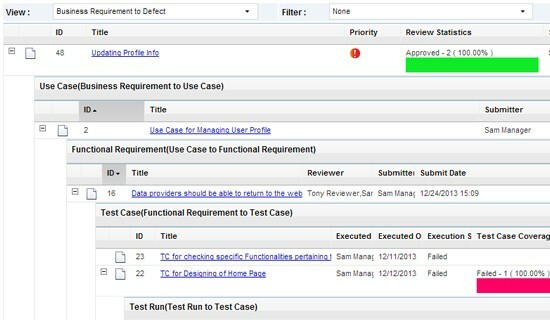 A relationship between records of Business Requirements and Use Cases has been shown in the sample screenshot below. You can filter the records as per the need. 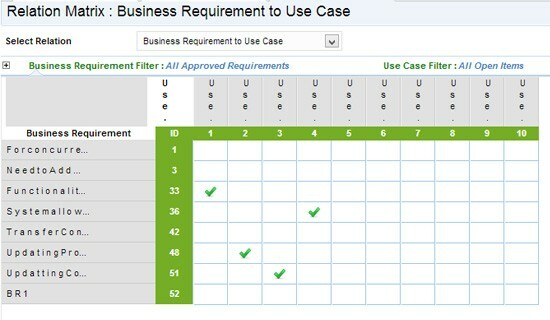 The green check mark indicates that in the relationship between Business Requirements and Use Cases, nobody impacts each other. By double clicking on any cell, relationships can also be created. Users can click on any cell being in relationship, and avail different options for editing and deleting the relationships. This type of view can be defined by users based on the relationships among different artifacts. These views can start from any point and can go to any point in the total chain. In between, steps in the relationship can also be skipped to view nested level relationships. This is a matrix type view which shows the type of relationships established between records of different artifacts. 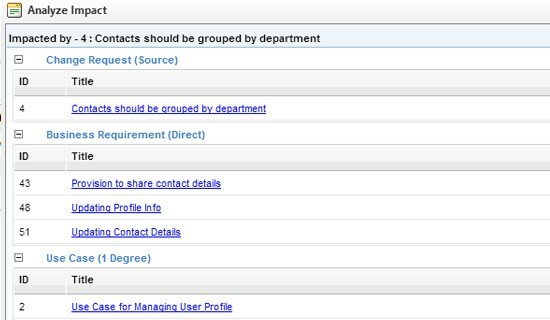 Relationships between records of Business Requirement ad Use Case have been shown in the sample screenshot below. You can also filter the records as per your need. 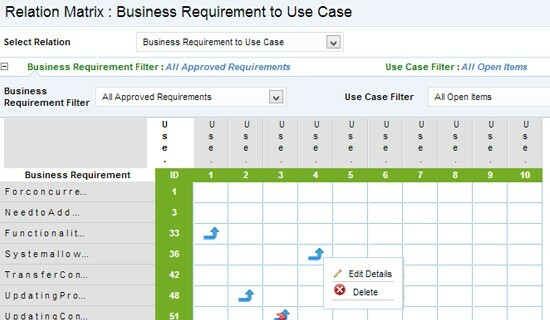 The blue arrow pointing towards the top indicates that Business Requirements will impact Use Cases. The blue arrow with a thunderbolt sign indicates that the particular Use Case has been impacted by the corresponding related Business Requirement. 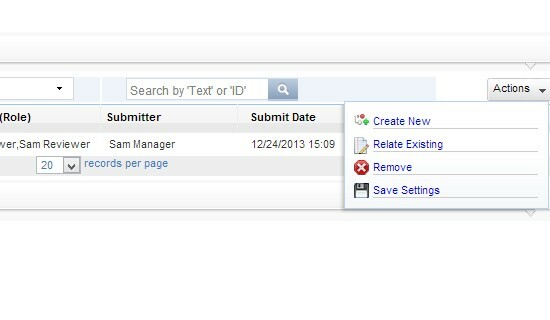 By double clicking on any cell, relationships can be created. Also, by clicking on any cell being in relationship, you may view different options for editing and deleting the relationships. This is a graphical representation of the relationships between records of different artifacts. It shows the relationships for a particular record. Kovair allows users to view impacts both before and after the impact occurs. 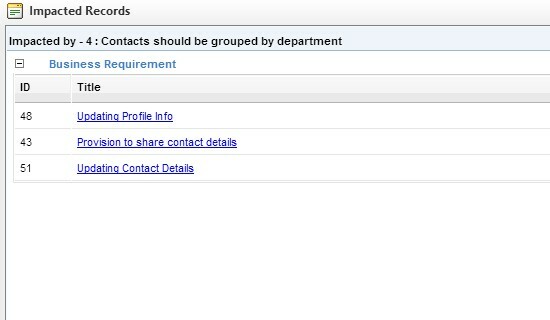 After a Change Request record is associated to any requirement, users can analyze the impact of the change on the total chain of records. Once the impact is raised by any record of any artifact, Kovair also allows viewing the impacted records against it. This impact can be seen both by record as well as from a central location. Kovair allows both proactive and reactive impact analysis. Impact of changes is forwarded to stakeholders automatically to ensure synchronization and to undertake corrective actions at the earliest to minimize the cost of changes at the end of the lifecycle. Want to see it live in action? Let’s do a demo.